Le French Oven by Hillary Davis is a beautiful informative cookbook on how to cook authentic French food in a French/Dutch oven. Hillary takes you through the pros and cons of using a French/Dutch oven and tells you how to choose the perfect oven for your meal. If you love beautiful cookbooks with lots of gorgeous photos this cookbook is for you. There are nearly 80 recipes that all include a short introduction with history and some suggestions on ingredient swaps and serving ideas. The recipes are grouped according to cooking method; braising, baking, stewing and roasting to name a few. The cookbook is perfect for both the novice and more advanced home chef, and would make a fabulous holiday gift for just about anyone on your list. Don't have a French/Dutch oven...no worries these recipes can also be done in a deep oven-proof skillet or oven-proof soup pot. But wait....this may be your lucky day! The Virtual Potluck team has partnered with Le Creuset to give one reader a chance to win a Le Creuset Dutch oven along with a copy of this wonderful book. When it comes to French ovens Le Creuset is the brand that comes to my mind first. They are known throughout the world for their quality colorfully-enameled cast-iron cookware and bakeware. If you have a piece of Le Creuset in your kitchen you know how awesome they are...if you don't I suggest entering the contest below!! There were so many delicious recipes in this book, choosing only one to make was very difficult. I finally decided to try the Lemon Braised Chicken with Green Olives. 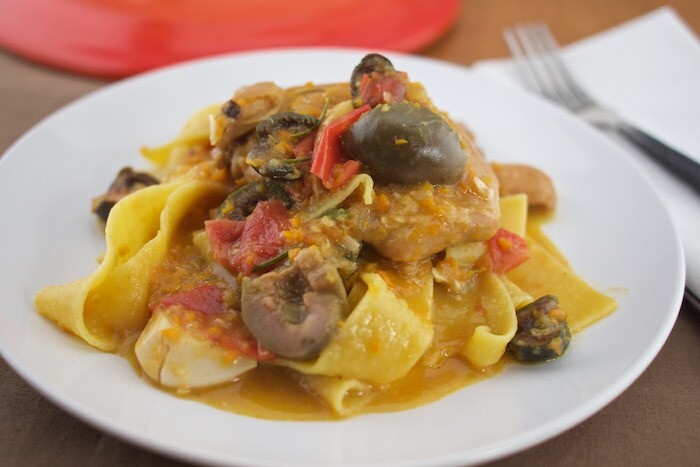 The finished product is fork tender chicken with a tasty gravy that pairs perfectly with pasta or egg noodles. It's a wonderful meal to serve for guests and something the entire family will love. Pat chicken thighs very dry with paper towels. Generously season with salt, pepper, garlic powder, and paprika. Place the onion, carrot, celery and leaves, and 2cloves garlic into the food processor. Pulse vegetables until finely chopped. Heat 3 tablespoons oil in the French oven over medium heat. Place the chicken in, skin side down, and brown until golden and crispy, for about 3 minutes. Turn the chicken over and brown the other side for another 3 minutes. Transfer to a plate. Pour remaining oil into the French oven and heat over medium heat to shimmering hot. Add the vegetables from the food processor and stir while cooking for 6 minutes. Sprinkle in the flour and stir while cooking for 1 minute. Pour in the wine and stock, bring to a boil over medium heat, and then reduce to a simmer. Add the chicken, remaining garlic, lemon, and half of the rosemary and cook on a low simmer for 20 minutes. Carefully turn the chicken thighs over and cook for another 10 minutes, or until they are tender. Cook a few minutes longer, if needed. If you would like a thicker sauce, use a slotted spoon to transfer the chicken and garlic to a plate. Bring the sauce to a boil and cook to reduce to the consistency you like. Put everything back in the sauce. Stir in the remaining rosemary, tomatoes with their seeds and juice, and whole olives. Stir and taste for seasoning, adding more salt and pepper, if needed. Gently reheat the dish. Serve over noodles, rice or pasta. I'm not a huge fan of green olives, but this sounds so good I want to try it! I love it all! the recipe looks amazing! You are on a roll! I entered because I absolutely love Le Creuset. By far the best cookware in the world. I would love the cookbook too! I love the Heritage Bakeware Set. It looks great! I would love to have the 13-Piece Stainless Steel Set. I would love to get my hands on a heritage pate terrine with press. I think it would find a lot of great uses in my kitchen! Le Creuset is such a great brand! What an awesome giveaway! Love the recipe too. Would you believe I don't have anything from Le Creuset! I would love to win! That chicken is right up my alley! I would like the 3 1/2 QT braiser in Caribbean color. How festive is THAT! I just love to use olives in cooking. This sounds so delicious! Thank you for sharing! I'm following everyone all over the place because I want to win!! Love their cast iron pot! I've always been a big fan of Le Creuset, they make some solid cast-iron pots! This is just one more reason that I should break down and open the wallet to buy one of their pots. I really love the flame braiser! I'd love to get the Deep Round Dutch Oven 5 1/4 qt. in the Cassis color. I slow cook everything! 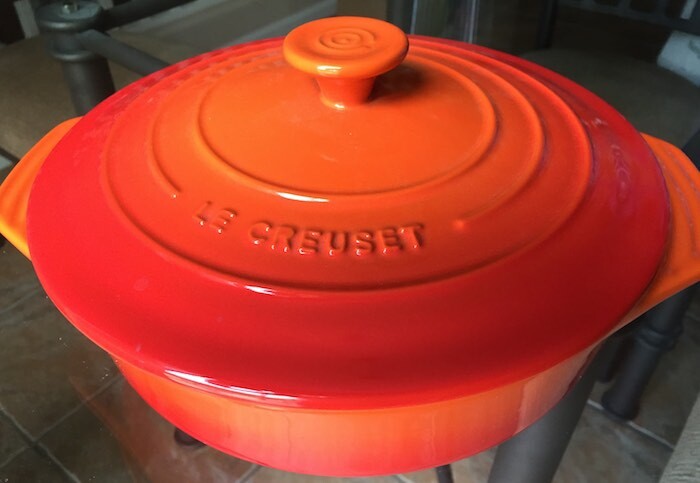 The Le Creuset 5 1/2 qt. round dutch oven has always been my dream and now I am excited for Le French Oven! I like the I like the Camembert Baker in Cherry. Great color. This looks so delicious, I love the lemon/green olive combination! Just shared on Facebook & pinned to pass the word, yum, yum, yum! Join us again at #TryaBiteTuesday and Happy Thanksgiving! I have to get this cookbook. The green olives is a nice touch. Sounds good. I love the mini cocottes! So cute! My husband loves green olives and chicken; so, this is worth trying. Everything on the site is awesome! I especially love the 3 QT STAINLESS STEEL SAUTE PAN! You can use it for everything! Thank you! Yes the 3 1/2 quart Braiser in Cherry would be perfect.thanks so very much for sharing. I would love the 7-1/4 Round Dutch Oven in Caribbean! So love this recipe! Shared on fb last, looks so good! Thanks for sharing with us at #TryaBiteTuesday - please stop by this week! the 7 1/4 round dutch oven in cream would be a dream come true! also...i had never visited their website before and i love that you can just search by their awesome colors ! very cool.